But Will It Work at Home? There’s one thing that’s sure about the information security field: Anything you can hide, I can find, given enough time and enough computing power. With peer-to-peer (P2P) networks becoming more popular (see the story in Briefly Noted), the kind of raw computing horsepower necessary to crack even the most powerful encryption scheme will soon be available, if it isn’t already. Using P2P distributed computing, last year one group discovered the largest prime number yet known, and another deciphered a message encoded with RSA Security's RC5-64 encryption algorithm. So that’s why new developments in quantum cryptography seem so promising. Rather than encrypting a message using a very large key and sending it using traditional electronic networks, quantum cryptography encrypts the message and sends it on optical networks as a stream of single photons. Eavesdroppers can’t sample or divert the light stream without altering it. The science is a good deal more complicated than this, and the technique faces some real world limitations. For example, besides being limited to optical networks – and unworkable over the Internet – current quantum cryptography has a very limited range and speed. Recently, scientists at Northwestern University sent data at 250mbps (megabits per second), still pokey, but more than 1,000 times faster than what was achievable with existing quantum technology. Swiss company Id Quantique (stupid name alert) successfully distributed quantum keys over a 60 km link at 1000bps. Other companies working on this technology include IBM, NEC, Verizon, BBN Technologies, and Magiq Technologies (Jeff Bezos is an investor). Each promises to deliver workable commercial products in 2003. It remains to be seen whether you and I will benefit from quantum cryptography, but it’s a cinch that the US military and other large operations that can afford all optical networks will be using the technique in years to come. Shameless Self-Promotion Dept. 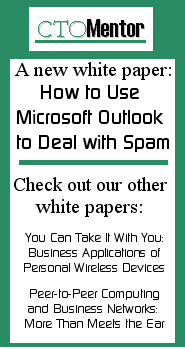 : CTOMentor has released a new white paper entitled, How to Use Microsoft Outlook to Deal with Spam. The paper describes how to set up email rules to route spam email messages that have been tagged by a spam filter to a special spam folder for later deletion. Also, check out the article I wrote for the Taylor Harkins newsletter entitled, Wherever they go, there you are about the wireless service known as Short Messaging Service (SMS). The article points out how marketers can use – carefully – this new way to contact their customers. Gateway Gets P2P: Here’s a great business model. Let’s say you’re a large, formerly direct-only, seller of personal computers. Let’s say you got the astonishingly bad idea of opening storefronts to sell them retail. And let’s say you called these stores, oh, I don’t know, Gateway Country. Let’s further say you now have thousands of demo models sitting on showroom floors doing pretty much nothing most of the time. Sounds like a bunch of non-performing assets to me. Well, now Gateway has found a way to monetize those assets by renting processing time to companies and organizations with huge computing projects. Gateway has partnered with veteran peer-to-peer (P2P) company United Devices to offer distributed computing resources to anyone able to pony up 15 cents per PC per hour. Gateway's 8,000 PCs can deliver 14 teraflops (trillions of calculations per second) of computing muscle. This sudden discovery of a new revenue stream for very little investment puts IBM’s recently announced plans to invest $10 billion in on-demand P2P computing in a different light. For more information on P2P computing, see the CTOMentor white paper, Peer-to-Peer Computing and Business Networks: More Than Meets the Ear. But Will It Work at Home? Congress in October introduced a bill that would create an Office of Global Internet Freedom. The new bureaucracy would fight Internet blocking and helping Web users in countries such as China and Syria get around censorship efforts and avoid punishment. The bill also would allocate $50 million each year over the next two years to develop and promote anti-blocking technology. I just wonder how we would feel if another country set up an agency devoted to circumventing our information policies like, say, copyright. Don’t Delay Supply Chain Modernization: Think you wait to modernize your supply chain? Think you can wait until Information Technology comes back into fashion as a strategic initiative before investing in electronic commerce? Think again. In the aftermath of the tragic events on 9/11, the world’s most savvy marketing organization, WalMart, showed how a real agile supply chain works. According to Geoff Colvin, Editorial Director, Fortune Magazine, on the Saturday following the tragedy, marketers at Kmart noticed that customers were buying a lot of flags. They contacted their suppliers to order a large shipment, but were told they were out of flags. Several days before that, on the morning following the tragedy, marketers at Target also noticed the run on flags. When they contacted their suppliers, they also found that no flags were available. How come? Because at 8:00 PM the evening of 9/11, the buyers at WalMart had ordered every flag available in the supply chain. Will it take a disaster to convince companies that there is a sustainable competitive advantage in creating and maintaining an agile, responsive supply chain? Yet Another Entertainment Suit: From the I Hate My Customers Dept. comes news that the Motion Picture Association of America is suing nine people in eight states for infringing copyrights by allegedly selling illegal DVD copies of movies on eBay. The DVDs in question were apparently bootlegged in Asia. Windows Cheaper Than Linux? From the He Who Pays the Piper Dept. comes this next item regarding a recent white paper authored by research group International Data Corp. The paper compared Total Cost of Ownership (TCO) for Windows and Linux servers across five enterprise computing workload situations at 104 companies. Interestingly, IDC found that Windows 2000 offered a lower five-year total cost in four of the five selected workloads. Who sponsored the white paper? Microsoft. 1. A modified mind warping Dimensional Warp Generator # 52 4350a series wrist watch with memory adapter. A quick search on Google turns up hundreds of hits for this exact message. So it’s spam, right? But what’s the point? One site suggested either a time traveler is really in trouble, or someone is trying to popularize another goof along the lines of All your base are belong to us. Others have suggested that hosting a copy of the letter on your site could generate traffic due to all the folks receiving the email who then go to their favorite search engine to find out information. But that would be wrong.